Mysuru: As part of Basava Jayanti, a three-day Rangoli art and drawing expo organised by Mysore Art Gallery at its premises on Ramanuja Road in city was inaugurated yesterday by artist L.S.N. Achar. 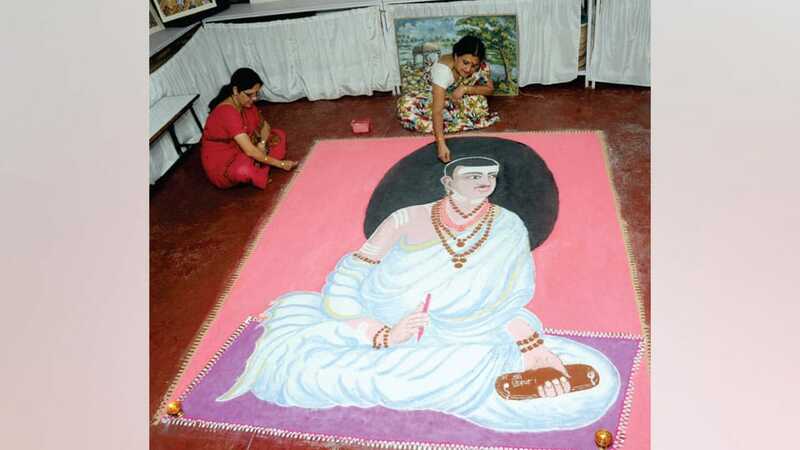 Rangoli Basavanna: The special attraction of the show was a 6 ft long and 6 ft wide giant sketch of Basavanna drawn in rangoli. The arduous task spanning about 8 hours was executed by Mysore Art Gallery President L. Shivalingappa, Srimathi and Arun Kumar. The other drawings that drew the attention of visitors were Basavanna being pushed aside by his associates when he touched Dalit Haralayya, Basavanna refusing ‘Upanayana’ and asking elders to perform the same on his sister, reaching the position of PM at Bijjala Kingdom and Basavanna captivated by the service of Haralayya couple.